Isn’t this a lovely botanical print? To me it is amazing that the book in which it was included still even exists. It was published in 1750. Yep. as in 26 years before the Revolutionary War. But, it was a time of great scientific expeditions that led to the cataloging of all of the world’s plants and animals. 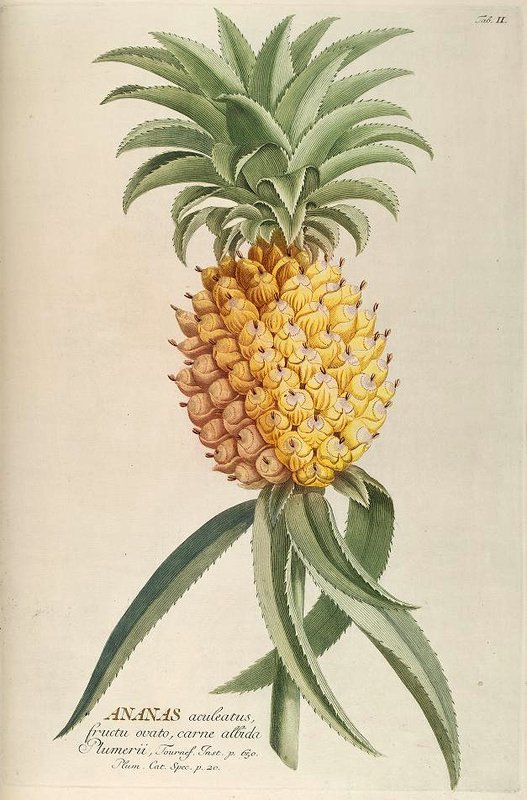 The artist of this pineapple plant illustration was the German Georg Dionysius Ehret (1708-1770). He was one of the foremost botanical artists of his time and his work is still influencing both scientists and artists over 250 years later. Originally named ananas, after the Tupi word meaning “excellent fruit”, these tropical fruits were also named for their similarity to the seed pods of conifer trees, otherwise known as pine cones. Interestingly enough, in botany, the pineapple is classified as a herbaceous perennial. Pineapples will have up to 200 flowers which join together to create the fruit. You may have noticed that pineapples are often included in mansions as decorative elements. Pineapples became quite popular in Europe and the well-to-do would grow their own pineapples in hothouses that were called “pineries.” In turn, pineapples became a symbol of wealth. History aside, this beautiful pineapple drawing is free to download and use in your own rich artistic endeavors.